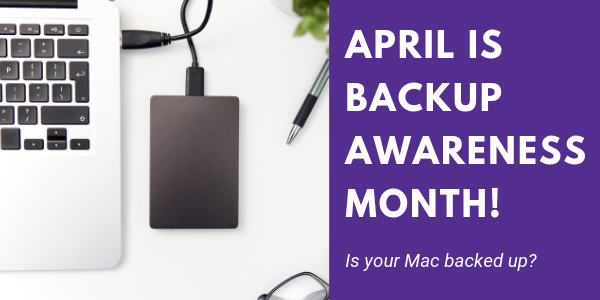 March 31st has officially become World Backup Day and we have designated April as Backup Awareness Month! But what is a backup and why do we need to designate an entire month to it? To understand why there is a World Backup Day let's first talk about data loss. What would you do if you lost everything? That may sound dramatic, but unfortunately, if you are not careful, it could become a reality. Think of all the personal information you have on your phone, tablet, and computer. Now imagine with just a snap of a finger it all disappeared. All of that data gone, forever. Every day this is happening to people all over the world. Luckily, there are steps you can take to protect yourself, but first, let's find out how people are losing all that data. Where Did All That Data Go? So why are people losing their data? Let’s look at the latest breakdown of how data is lost. Looking at those numbers, between hardware malfunctions, software corruption/computer viruses and natural disasters, 68% of all data loss is entirely out of your hand. The other 32% are human mistakes and who has not deleted something by accident on their computer before? The bottom line is that your data is not safe. Thankfully there is a solution for protecting your data, by having a backup. A backup is a second copy of all your important files, including your family photos, home videos, documents, and emails. Instead of storing these files all in one place (like your computer), you keep another copy of everything somewhere safe. Data backup will keep you protected against any of the previously mentioned disasters. How Does One Backup Their Data? So we have established it is essential to backup your data, but how does one actually go about doing that? There are two main way to backup data. Copy your files to an external hard drive. Set aside 15 minutes to an hour to back up all of your existing files on your desktop, laptop or any other device. Purchase a hard drive (we can help you choose the right one) and simply copy your files to the drive. Take it to the Clouds. Can’t buy a drive in time for World Backup Day? No problem! There are plenty of cloud storage options that are available to backup your data. Check out this list of the best cloud storage if you need help choosing. To build awareness for this data loss epidemic, March 31st has officially become World Backup Day. World Backup Day is a great reminder to get people asking the question “Am I backing up my data?” Thankfully, Springboard Media is here to help by offering an amazing World Backup Day Bundle. The bundle includes a 1TB G-drive Mobile and a Time Machine backup performed on your current Mac by one of our service professionals. The only stipulation is the Mac cannot be damaged. This offering is typically $179, but starting March 29th-April 13th, this amazing bundle will be only $159! Do no miss this opportunity to guarantee your most prized possessions are protected! Do not let yourself be a senseless victim to data loss and protect yourself today by backing up your data! Come into Springboard starting March 29th, and we will make sure your data is protected! WHEN NOT READING NOVELS, BINGING TELEVISION SHOWS OR WATCHING THE LATEST MOVIE, DUNCAN SPENDS HIS TIME TELLING THE STORY OF SPRINGBOARD MEDIA THROUGH CONTENT, SOCIAL MEDIA AND MORE.